In school we were taught that after the fall of Rome, Europe slided into the dark & murky Middle Ages. The heritage of the culturally advanced Greek & Roman civilizations slipped back into oblivion and only at the dawn of the Renaissance Europe came back to life. Well, this is not entirely as it was. From 711 to 1492, an advanced cosmopolitan civilization thrived on the Iberian Peninsula. More than that, Arabs, Christians & Jews co-existed here, usually in peace. Together they built a great, culturally advanced civilization that would influence (later) Europe much deeper than most of us are conscious of. It was considered ‘the ornament of the world’. María Rosa Menocal in lucid language tells us about a part of European history not known to many. 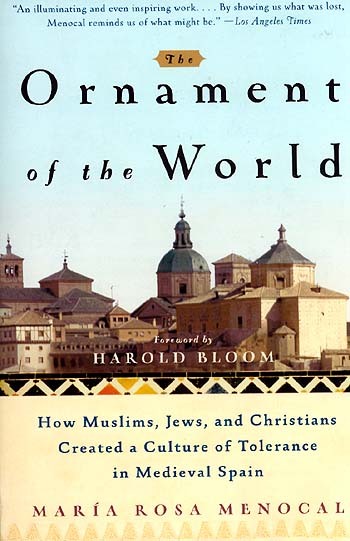 What makes this book such a pleasant read, are its short mostly chronological chapters dealing with specific subjects such as architecture, Cordoba, Jewish mysticism, Toledo, poetry, translating, influences upon other parts of Europe, to the downfall of this great civilization, when Ferdinand & Isabella took over the keys to the Alhambra from the last Ruler of Islamic Spain, Boabdil: it was ‘the moor’s last sigh’. First, the House of Umayya ruled the Islamic world. Then came the Abbasids who eradicated the Ummayyads. Their sole survivor, Abd al-Rahman fled west and joined the Berbers who had just crossed over to the Iberian Peninsula. These Berbers recognized him as the sole inheritor of the House of Umayya, and soon Abd al-Rahman became the first Moorish caliph, and he recognized the rights of Christians and Jews as ‘people of the book’, so they lived together in peace. Abd Al-Rahman missed his Syrian homeland and so he imported palmtrees and irrigational techniques, ordered mosques and other buildings in Arabic style to be built, had libraries built containing the literature he knew from home. His love for the Arabic poetic tradition (that stretches back to before Islam) with its elegant verses and sensual songs inspired many, and soon Arabic was not only the vernacular but even commentaries on the bible could only be found in Arabic; Latin got nearly abandoned, rendered as 'old fashioned'. Arabic was [and still is] ...“a language alive and powerful enough to speak to God and to a man’s beloved”, as María Rosa Menocal puts it. Who ever was present on a reading —or more precise, singing— of traditional Arabic poetry, knows how beautiful and seductive this language can be. After the 10th century, the country endured many inner struggles that greatly weakened it. Soon after Ferdinand & Isabella took over the keys to the Alhambra in 1492, they expelled all Arabs and Jews: an era of tolerance ended. Now, after September 11, while Muslims in the U.S. who fear for their safety change their Arabic names to western ones, synagogues are burning once more, and voices here in the West can frequently be heard speaking an ignorant and arrogant, oblivious and Islamophobic language. To this, The Ornament of the World offers a radical different anti-dote by reminding us that things can be different when we are willing and able to make the effort. Borges: a Life -- Edwin Williamson. In 1938 Borges injures himself, leading to blood poisoning and coma. When Borges recovers he believes his intellect has suffered damage, and therefore gives up writing criticism. He switches to short fantastic stories, the first being Pierre Menard, Author of the Quixote. His second story Tlön, Uqbar, Orbis Tertius is one of the best things I've ever read. After 1955 his blindness sets in, but his work starts to receive international attention and is translated into many languages. His mother (who died age 99) and several women and girlfriends read to him. Borges is rewarded with prizes and honorary doctorates all over the world. Williamson argues that it was Borges' complicated relation to women that was the decisive influence on his work; I still think it was books.